Workplace Basics, Workplace Skills and Workplace Skills: Student Book are the three books in the top 300. One of the three books in the top 300. 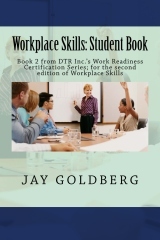 DELRAY BEACH, Fla. - June 23, 2015 - PRLog -- Jay Goldberg’s work readiness training series continues to be popular. On June 23rd three of the eight books in the series were in the top 300 books in the training category on Amazon. There are four modules in this series each with an instructor book and a classroom book. The classroom books are the same as the instructor books only without the answers to the exercises and the chapter reviews. The chapter reviews were left out of the student books so that the instructor can use the chapter reviews as a question and answer demonstrated competency exercise if he or she desires. They can also be used as the basis for a group discussion in-class exercise. In addition to the lecture content, worksheets that can be personalized and exercises; each book contains two scenarios where things go right and things go wrong. These scenarios can be used to generate final or certification tests. No test questions for these scenarios are contained in either book which allows each venue to create and protect their tests. Visit Jay Goldberg’s author page on Amazon here: http://www.amazon.com/Jay-Goldberg/e/B0083056QW/ref=dp_byline_cont_book_1. For more information on the consulting services provided by DTR Inc., go to http://www.dtrconsulting.biz.